It only took a few short excerpts to be drawn into the magic of Dublin-based vocalist and songwriter Sue Rynhart’s twelve-track album Signals. A collection of jazz-inflected folk compositions, it continues the partnership with Dan Bodwell established in 2014’s debut release Crossings. The revelation is that the perceived acoustic simplicity of voice and double bass actually presents such a richness of unpredictable artistry, with Rynhart’s imaginative and individualistic approach perhaps comparable to Björk and Lauren Kinsella, and her synergy with the multi-faceted technique of Bodwell endlessly compelling (so much so that a shiver of emotional pleasure is never far away). Melding melodic Irish folk tradition and enigmatic poetry with oblique, atmospheric twists, the duo radiates a beautiful, contemporary freedom of spirit. Rynhart’s pure, dextrous voice communicates her original writing in a personal, storytelling way that suggests it simply wells up from inside and demands to be heard, whilst Bodwell’s pizzicato-dancing bass is able to shift into arco lyricism and mystery. Descending-bass jazz number Be Content has a catchy familiarity, whilst smouldering Foxed couples a subtle, thrummed bass groove with Rynhart’s wide, enquiring phrases (“Oh little red fox I know you’ve been there, but today your coat looks brighter than a gemstone rare”). Dramatic whisperings and close-to-the bridge bass creaks in The Tree precede a plaintive annunciation which becomes elaborated with wisps of choral psalmody and the classically-interpreted folk of E J Moeran or Vaughan Williams; Little Sparrow‘s autumnal melancholy is simple and tender; and The Coldest Month‘s openness lilts with harmonic bass colour. Closely layered vocals in Compassion are extraordinarily intricate, and haunting harmonies in a new interpretation of In Dulci Jubilo (with multi-instrumentalist guest Francesco Turrisi providing drum rhythm) suggest the period work of Trio Mediaeval. A contemporary edge is maintained by the dark, arco bass and fluid vocalisations of In Between, accentuated by Rynhart’s persistent mbira chimes; and Black as the Crow Flies (“Twinkle twinkle are your eyes tonight, black as the crow flies on a new moon and never went home”) stands out with its hushed tones and an especially captivating, pliant bass motif from Bodwell. Sue Rynhart paints so vividly with words and music, the repeated phrases of solo piece Summer Bell offering an impression of distant peals across endless fields; Turrisi’s baroque-ornamented then rock-grooving lute in Silliest Game perfectly complements the elegant, bittersweetness of this new Irish folk song; and Wall, Wall, Another Wall closes with a dreamy overlay of speech and floating, sung phrases. Released on 28 April 2017 and available as CD or vinyl from Sue Rynhart’s website, or as a digital download from Amazon or iTunes. Wallflower is a new studio recording of songs garnered from the five-time Grammy Award-winning jazz pianist/singer Diana Krall’s formative years. It mostly takes familiar pop ballads from the ’60s through to the present day, often shifting them further down a gear, and colours them in with lush orchestral arrangements. For anyone who appreciated the beautifully limpid, slo-mo interpretation of I’ve Got You Under My Skin from Diana Krall’s superb live album A Night in Paris, it will strike a pleasing chord. MUSICAL DISCOVERIES are, I believe, waymarkers on a lifetime’s journey of appreciation and enjoyment of the artistic creativity that those blessed with a talent bestow upon us. Once experienced, they stay with us forever, evoking memories of the first unexpected rush of exhilaration that touched our soul. In 2010, I chanced upon a debut release (Kairos Moment) by hitherto unknown contemporary jazz ensemble, Kairos 4tet. Led by indomitable saxophonist Adam Waldmann, their originality spoke loudly and clearly to me – and amongst the instrumental energy, a jazz vocalist delivered a single heartfelt ballad, Unresolved. Transfixed by its depth and beauty, I went on to discover this solo artist’s own debut album (And So It Goes… with pianist Barry Green) as well as appearances on subsequent Kairos albums and intimate piano-accompanied performances in London and Manchester. Unsurprisingly, Emilia Mårtensson is rapidly making a name for herself on the London jazz circuit and beyond. A grounding in the folksongs of her native Sweden and standards of the leading ladies of jazz, combined with an admiration for a singer-songwriter genre that includes Paul Simon, James Taylor and Joni Mitchell, has resulted in a meltingly gorgeous voice characterised by sincerity, warmth, dynamic control and endearingly crisp Anglo-Swedish diction. Masterminded by producers Rory Simmons and Alex Bonney, this second solo release features a particularly inventive instrumental line-up, the spacial detail of which complements and colours Mårtensson’s sensitive approach so appropriately. As before, Barry Green’s expressive and intuitive piano is the perfect match for Emilia’s velvety tones. Rhythmic and ornamental zest is provided via a refreshing range of timbres from Brazilian percussionist Adrian Adewale; and bringing a deep sense of equilibrium is bassist Sam Lasserson. Finally, fashioning the most wonderfully interwoven textures on half of the album’s ten tracks are the Fable String Quartet, whose precision and integrality with this project are outstanding. Illustrating all of this is opening number Harvest Moon, written by Jamie Doe, Emilia’s soft vocals floating above a gently bubbling momentum. In profound dedication to her grandmother, Ana is communicated with love (Soft, at night, her hand on mine, she says, “Close your eyes before you open up your mind”), Barry Green decorously enhancing the affectionate mood over Sam Crowe’s delicate string arrangement. Barnaby Keen’s Learnt from Love is a standout, the distinctive chord progressions and melody of the chorus, in particular, still lodged in my mind from a live first hearing last July; and Emilia’s voice also displays a brighter, stronger edge. Tomorrow Can Wait is perfect for Mårtensson, the heart-on-sleeve poignancy of writer Emine Pirhason’s verses emphasised by the initial sparseness of solo piano, and Emilia’s digitally-layered harmonies are used to great effect here, suggesting her folk roots. Traditional Swedish folksong is represented by bass/percussion-accompanied När Som Jag Var På Mitt Adertonde År; and Black Narcissus Music, Joe Henderson’s familiar tune set to Emilia Mårtensson’s skilfully-intoned words, is interpreted breezily courtesy of a great Rory Simmons string arrangement which melds perfectly with the instrumental trio. Paul Simon’s Everything Put Together Falls Apart comes so naturally to Mårtensson before Green and co. run with it in a jaunty, bluesy direction. Moffi’s Song confirms her own songwriting prowess, its string-led arrangement imbuing this tribute to her grandfather with the feel of an old jazz classic; and to close, a folksy unaccompanied miniature, Vackra Människa – the translation, ‘beautiful person’, so very fitting for this accomplished singer. 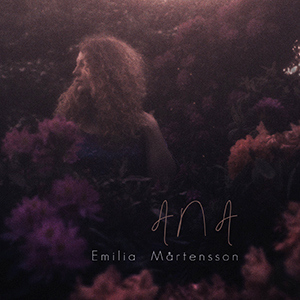 Released on 7 April 2014 (in Babel Label’s 20th anniversary year), Ana is available here … a musical discovery awaits.